Mushin is a suburb of Lagos on the Mainland that is known for several reasons: it hosts Bruce Onobrakpeya, a famous nigerian artist, but it is also the go-to place to find car spare-parts. There are countless workshops and a vast market that borders the Apapa - Orowonshoki Expressway. This is the territory of Igbo traders who have progressively established camp here. As one moves through the dirt streets, full of potholes, both sides of the street are laden with all sorts of goods and vehicles. Traffic is not for the faint-hearted as space left for vehicles is scarce and drivers daring. But somehow, with time on one's side, there is a solution to everything and there is always someone to offer assistance because it is in the common interest that traffic does not clog the area completely. The market is busy, hawkers everywhere, workshops full of people repairing or buying and selling parts, the ground is littered with plastic. Suddenly an unusual figure appears in the midst of the crowd. 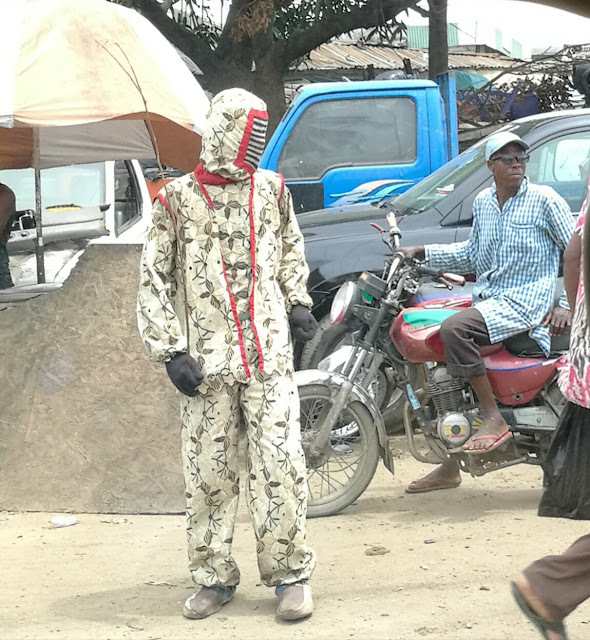 Holding with a gloved hand a long stick made from the branch of a bush, wearing trousers and top of the same fabric, the top actually carefully joining a hood which has a net to hide the face of the wearer: an Egungun is collecting money. We call him " Egungun" and he comes to get a small note and goes further collecting. Egunguns seem to roam the market on a regular basis. The money they collect is apparently to fund the Egungun festival ceremony that happens towards mid year.